According to the AVMA, 30% of U.S. households own a cat, but not every cat owner is equipped with the necessary information to give their feline companions the happiest, healthiest life. Felines are unique creatures in how they behave and in their needs (hunting, play, etc. ), so if you’re a cat owner or thinking of becoming one, it’s important to understand these characteristics. Summit Animal Hospital has devoted this page specifically to cat owners to address some of the most important topics involved with owning a cat. If you have any questions about the information on this page, please feel free to ask. We’ll be happy to help! Click on the subject you’d like to learn more about to be automatically directed to that topic. Many cats are known to be a little timid with strangers and in new environments. If you’re bringing a cat to your home for the first time or if you’re a first-time cat owner, it’s important to know how to safely handle them. Mishandling a cat can lead to stressful situations, both for the cat and for you, and could even result in injury if you're not careful. If your cat appears uncomfortable with you, let them smell your hands first so they'll know you're not a threat. Let them become familiar with your scent, and don’t pick them up until they appear comfortable with you. Always use two hands to pick up your cat for the first time. Do not scruff! Cats instinctually eliminate and cover their waste in dirt or sand while kittens typically learn how to use a litter box from their mothers. With that in mind, training your cat to use a litter box should require little or no effort on your part. Just be sure to clean the box at least once a day. If you have multiple cats, it’s best to have one litter box for each cat. Cats aren’t typically particular about the type of litter in the box, but if you discover that a brand change is necessary, make the change gradually by mixing the new litter with the old one. This will decrease the chances of your cat eliminating outside of the box. Leave food and toys in the carrier to create a welcoming environment inside. Leave the carrier out in the open near places where your cat already frequents. Reward your cat every time they spend time in the carrier so they won’t associate it with a dreaded road trip to the vet. 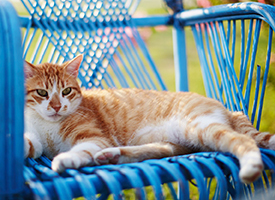 Remember, Summit Animal Hospital in Eldersburg is a feline-friendly practice, so our staff is fully trained on the proper low-stress handling techniques and can provide you with additional carrier tips at the time of your cat's visit. If you don’t plan to breed your cat, we recommend that you spay/neuter them by 6 months of age. This will eliminate your cat’s heat cycles and the risk for mammary tumors. For males, it will eliminate aggressive behavior and spraying. With these health benefits, spaying/neutering can actually increase your pet’s lifespan. Cats have an instinct to hunt, so when it comes to buying toys, choosing the ones that satisfy these instincts are best. Some of the feline favorite includes laser light toys (just be sure not to shine them directly in your cat’s eyes), mouse toys, dangling toys, and interactive toys. If your cat still has their claws, buy a scratch post. Cats instinctually scratch certain surfaces to remove the dead outer layer of their claws, mark their territory, or to simply stretch their bodies. Unfortunately, your living room couch can become a targeted surface if there's no scratch post available, or if your cat isn’t yet trained. Place the scratch post(s) in an area that's easily visible and accessible to your feline friend. You may also want to consider adding catnip to the toys and scratch posts to attract your cat to them. Although cats groom themselves naturally, grooming is a great way to bond with them and get the areas that your feline friend might have missed. Grooming is especially important for long-haired cats, as it helps eliminate hairballs and shedding on your carpet, clothes, furniture. Claw trimming is another important part of grooming. Claws can get very sharp and become curled, which can be painful for you if your cat decides to stretch while seated on your lap. Long claws can also get caught in clothing, furniture fibers, and a number of other places. 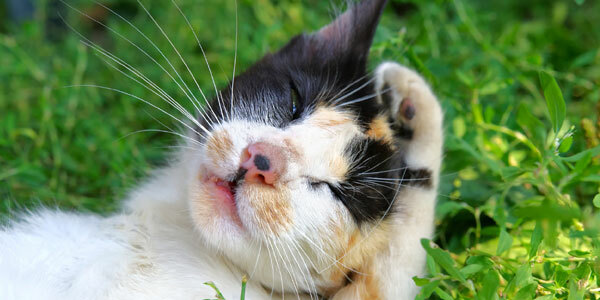 Try to trim your cat’s claws every couple weeks above quick, which is the dark section of the claw. We can demonstrate proper claw trimming as well as tips on how to effectively handle and restrain your cat during grooming at your next visit to our hospital so you can be sure you're doing it correctly.